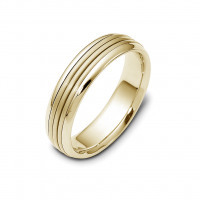 This contemporary two tone men's band features a triple grooved center section in white gold, giving the illusion of three bands stacked next to each other, and surrounded by high polish yellow gold rims. 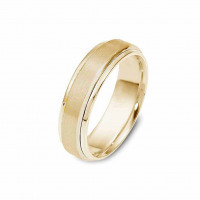 The ring is available in 10 kt, 14 kt, and 18 kt gold, as well as in multiple metal and color combinations. As always, this ring is comfort fit for ease in wear. Please use our filter to find your perfect combination, or contact us if you cannot find what you're looking for.